Home News Snow in east Auckland? 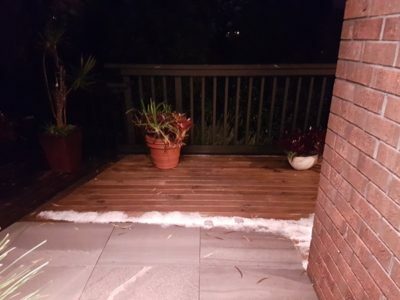 Last Thursday, east Auckland experienced clouds, rain, hail, thunder and lightning and…snow? 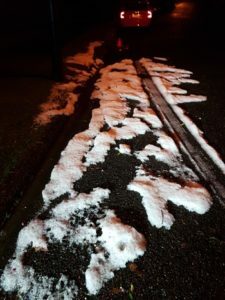 One Mellons Bay resident was shocked to discover a load of what looked like snow outside his house on Charles Dickens Drive on Thursday evening. Ray Mason arrived home from the America’s Cup Parade shortly before 7pm to see the ‘snow’ in the gutter outside his house and on the porch. 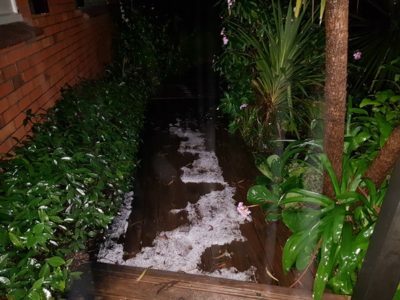 However WeatherWatch head weather analyst Phillip Duncan said there was reports of heavy hail in Howick, and this was more than likely the case. Duncan said it was “way, way, way too warm” for snow in Christchurch, let alone Auckland where the temperature was sitting around 14-17degC. He said for comparison, when it did technically snow in Auckland in August 2011, the air temperature was about 4degC with rain. Duncan said on occasion hail can look like snow, citing a recent hail shower in the South Island that looked like snow. He said the Auckland snow flurry in 2011 was caused by an Antarctic southerly, while yesterday’s hail was caused by a sub-tropical nor’wester.